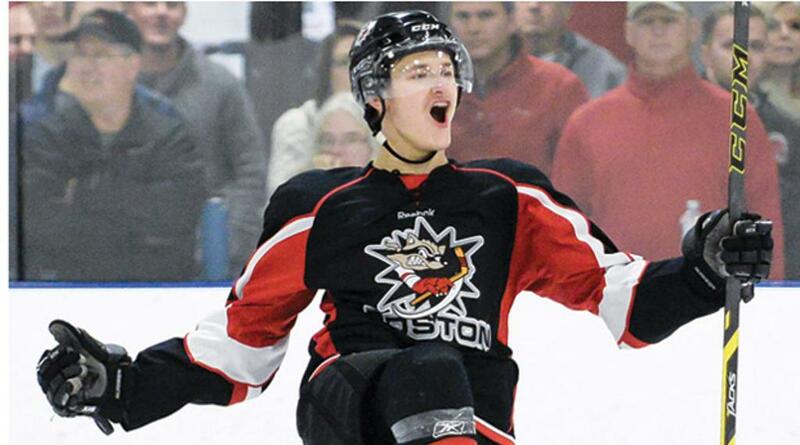 Eduards Tralmaks had 28 goals and 27 assists for the Junior Bandits in 40 games for his last season of junior hockey. Tralmaks, who has played for Latvia in the World Junior Championships, moved on to the Chicago Steel of the United States Hockey League where he tied a playoff record with 10 goals in 14 games in helping lead the Steel to the Clark Cup. He also had two assists. ‌Tralmaks had 11 goals and 16 assists in 46 games during the regular season but he was slowed by a broken ankle suffered early in the season. “It was really hard to come back mentally and physically,” said Tralmaks. “I wasn’t in shape at all. But the coach (Dan Muse) gave me a lot of ice time and my confidence came back. At the end of the season, I started playing real well. I had a points streak. And I was ready for the playoffs. “I was glad I could help the Steel (win the Cup). I had good linemates. We had a lot of good players who could have also gotten the MVP,” said Tralmaks who was on a line with Jack Badini, who is now playing at Harvard, and Marc Johnstone (Sacred Heart). The University of Maine was the first school Tralmaks had visited and he saw the Black Bears play arch-rival New Hampshire. “I thought it was the best place to play. It was a no-brainer. I really wanted to go there and play in front of the student section (in the balcony),” said the 6-foot-3, 190-pound Tralmaks. He didn’t register a point in his first two games at UMaine but has scored at least a goal in four of UMaine’s last six games entering a Friday-Saturday Hockey East series against Boston University in Orono and Portland, respectively. Tralmaks finished his freshman season with the Black Bears with 11 goals and 14 assists in 37 games. His ability to dominate play in competitive Hockey East is one of the main reasons Tralmaks was so heavily recruited to attend NHL development camps. There were several teams interested in having Tralmaks join their camps but he ultimately settled on the Ottawa Senators. The Bandits wish Eduards all the best as he continues his hockey career with Maine and as he gets his first impressions of the NHL with the Ottawa Senators.